PM’s criticism of the opposition over loan waivers comes days after Congress chief Rahul Gandhi said his party will not let Modi rest till the Centre writes off farm loans across the country. Prime Minister Narendra Modi Thursday accused the Congress of misleading farmers in the name of loan waivers. Addressing a rally in Dharamshala to celebrate one year of the Jai Ram Thakur-led BJP government in Himachal Pradesh, PM Modi also stressed on the one pension scheme implemented by the Centre. His criticism of the opposition over loan waivers comes days after Congress chief Rahul Gandhi said his party will not let Modi rest till the Centre writes off farm loans across the country. The sharp reaction came a day after the newly-elected Congress governments in Chhattisgarh and Madhya Pradesh waived farm loans. The recently elected Congress governments in Madhya Pradesh, Chhattisgarh and Rajasthan have announced loan waiver schemes. Immediately after taking over as the new Chief Minister of Madhya Pradesh, Kamal Nath waived loans of farmers to the tune of Rs 2 lakh each, as on March 31, 2018, taken from nationalised and the cooperative banks and thereby, delivering on the Congress pre-poll promise of cancelling farm loans within 10 days of coming to power. Chhattisgarh Chief Minister Bhupesh Bhagel followed suit and announced his government will waive farm loans worth Rs 6,100 crore of around 1.66 million farmers. Rajasthan chief minister Ashok Gehlot too announced waiver of short-term loans taken by farmers from cooperative banks and loans of up to Rs 2 lakh from other banks. The waiver would cost Rs 8,000 crore to the state government. 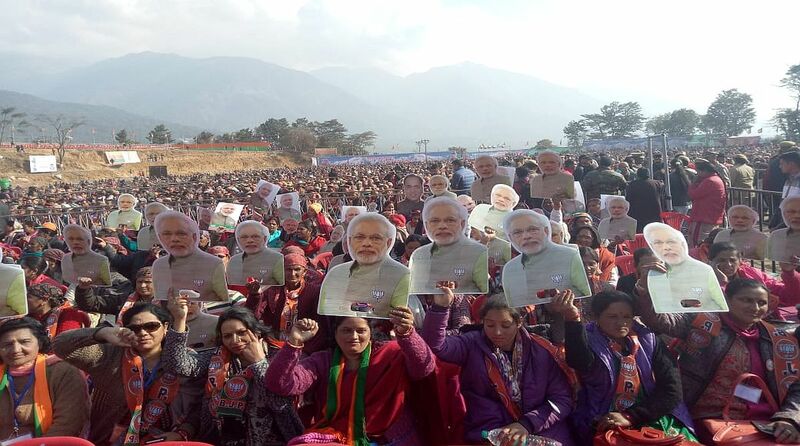 Meanwhile, Modi said development projects worth Rs 26,000 crore were under way in various sectors in Himachal Pradesh. He described Himachal Pradesh as the land of brave soldiers who were ever ready to make the supreme sacrifice at the border. The prime minister was set to release a booklet on the achievements of the BJP government in the state. Modi went through an exhibition put up by the state government to showcase the benefits of state and Centre-sponsored schemes. The prime minister was welcomed by the chief minister, former chief minister Prem Kumar Dhumal, Kangra BJP MP Shanta Kumar and Union Health minister Jagat Prakash Nadda at the helipad in Dharamshala. Himachal Pradesh Governor Acharya Dev Vrat was also present.